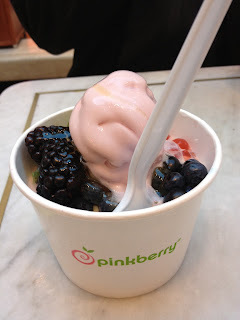 Although I had been to Pinkberry’s grand opening in West Edmonton Mall, I hadn’t had the opportunity to visit them again since then. I was curious to see what their prices and regular portions looked like. Since I had a $20 Groupon for Pinkberry, I thought it would be the perfect opportunity to review the real experience. It turned out that $20 at Pinkberry was quite a lot, as it allowed us to order two large Pinkberry’s with toppings, as well as a fruit parfait. The amount of frozen yogurt they put into the cup is quite generous and the amount of toppings they put in is only limited by the space available that isn’t already filled with frozen yogurt. Personally, I would’ve loved it if they’d put a little less frozen yogurt in and left a bit more room for toppings. 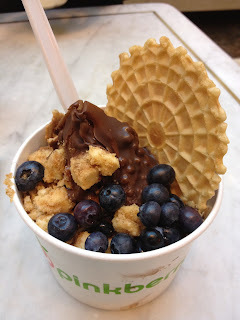 I ordered a chocolate Pinkberry frozen yogurt, topped with chocolate sauce, cheesecake bites, dark chocolate crisps, graham cracker crumbs, blueberries and topped with a waffle cookie. The cheesecake bites were soft, adding a contrasting texture to the crunchy dark chocolate crisps, which popped in my mouth with every bite. The frozen yogurt seemed unusually cold as the chocolate syrup hardened against it, instead of staying liquid, and there was far too little for my liking. The frozen yogurt was so cold in fact that the inside of my mouth felt frozen after a half a dozen bites, yet the amount of time it took to make it to the bottom of the cup left me with just a puddle. Having had their frozen yogurt before without the overly cold issue, I assumed that the machine the chocolate frozen yogurt came out of was having issues and was likely an anomaly. The fruit parfait consisted of vanilla and mango frozen yogurt, granola, blueberries and pineapples. Overall it seemed like the reverse of a small Pinkberry, heavy on the toppings and light on the frozen yogurt. The fruit flavoured frozen yogurt tasted refreshing and not too sweet. Overall, there was more than enough frozen yogurt treat to satisfy any craving, and was probably cheaper than other frozen yogurt stores which sell by weight. However, the lack of customization left me wanting more. Although Pinkberry has a solid tasting product and some great toppings, I would personally rather have the ability to control the frozen yogurt versus topping ratio. 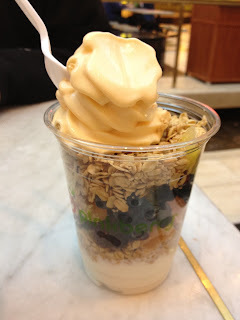 However, for those seeking a good solid, no fuss frozen yogurt while perusing the expanse that is West Edmonton Mall, Pinkberry is a great option and easy to find!